They fit me in even though there was an error with Zocdoc. The Dr. was in fact booked and didn’t haveall of the times available in the site but they still honored my appointment despite the error. They fit me in even though there was an error with Zocdoc. The Dr. was in fact booked and didn’t have all of the times available in the site but theystill honored my appointment despite the error. 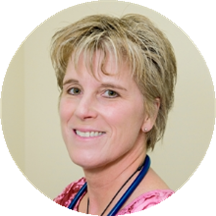 Dr. Beth Dennis is an emergency medicine doctor in Fort Belvoir, Virginia and is affiliated with Fort Belvoir Community Hospital. She received her medical degree from University of Virginia School of Medicine and has been in practice for 24 years. She is one of 3 doctors at Fort Belvoir Community Hospital who specialize in Emergency Medicine. Great PA. Always quick and responsive with questions. Highly recommended. They were great! That was the fastest doctors appointment I’ve ever had. In a good way. Very stream lined but they listened well. I’ll definitely be back. They were very professional and nice. Listened patiently about my situation and symptoms. I’m new to living in the US again so I was worried and nervous before coming. It was as pleasant an experience I could have had when feeling so I’ll. Thank you! It was good and accurate about my situation. She was the best, honestky. She is super intelligent and makes you feel like she cares about you. Beth is really nice and professional. My husband saw another physician at this practice and did not have a good experience so I was pleased that Beth has been such a good PcP so far. I had wonderful visit with Dr Dennis. Dr. Dennis and her physician's assist, Katie, were both very warm and helpful. Two appointments with Dr. Dennis and both were very good. She spends time listening and is very approachable and warm. Dr. Beth is one of a kind. Direct, knowledgable, prudent, and funny. I would want her to be my doctor for everyday colds all the way to an emergency. She is highly knowledgeable and has empathy and very cheerful. Dr. Dennis was great. She also had a wonderful bedside manner.